Researchers at Michigan Technological University created digital switches by combining graphene and boron nitride nanotubes. The combination of these two materials makes for a workable digital switch, which is the basis for controlling electrons in computers, phones, medical equipment and other electronics. This study is a step forward in making semiconductor-free transistors, bypassing many of the troubles that plague silicon. The main challenge was fusing the materials together, and the scientists addressed it by maximizing their existing chemical structures and exploiting their mismatched features. 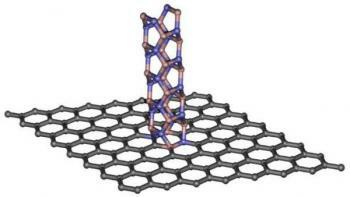 The team exfoliated graphene and modified the material's surface with tiny pinholes. Then the researchers could grow the nanotubes up and through the pinholes. It was found that there is great importance in the materials' different bandgaps - put together, they formed a band gap mismatch that creates a so-called 'potential barrier' that stops electrons. Graphene's flat sheet conducts electricity quickly, and the atomic structure in the nanotubes halts electric currents. This disparity creates a barrier, caused by the difference in electron movement as currents move next to and past the hair-like boron nitride nanotubes. These points of contact between the materials—called heterojunctions—are what make the digital on/off switch possible. Since the materials are respectively so effective at conducting or stopping electricity, the resulting switching ratio is high. Actually, how fast the materials can turn on and off is several orders of magnitude greater than current graphene switches. In turn, this speed could eventually quicken the pace of electronics and computing.